That dimensionality—those shifting planes that you refer to—also seems relative to your inclusion of both highly abstract andrepresentational elements in your work. What is your thinking behind that? Absolutely; you have essentially constructed your own lexicon in which to converse among these mark-making styles. 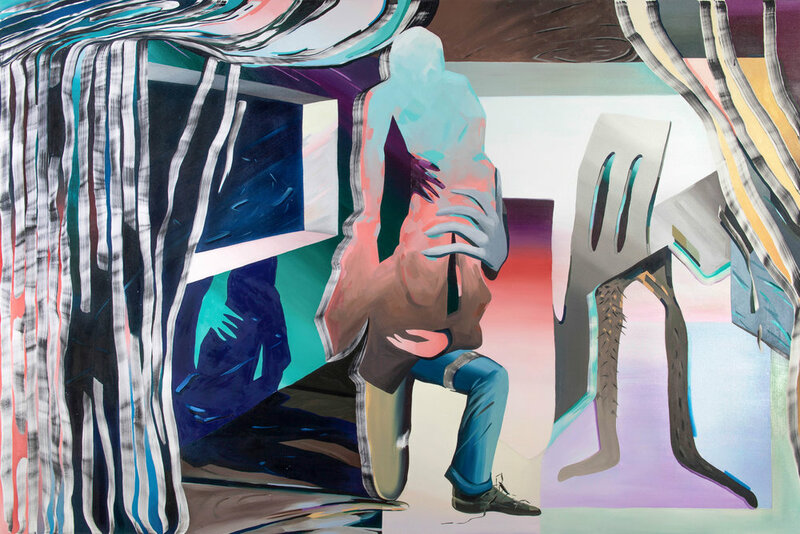 Karen Seapker, Congregate (2016), oil on canvas, 72x108 inches. The state of contemporary abstract painting and the extensive recurrence (or recycling) of minimalism has been subject to much postulating and criticism in recent years. Verbiage such as “genius” and “inspiration” as well as discourse which relegates an artwork’s origin to the internal self, are common points of contemporary art dialogue which indicate the return of Greenbergian ideas and laconic appearances. This subjective return to modernist formalism—given the various contemporary monikers, critical and otherwise, of Modest Abstraction, Neo-Modernism, and Dropcloth Abstraction—does not directly engage in the ideas and work of those avant-garde progenitors heralded by such nomenclature, but rather, their surfaces. Carol Saffell, a self-taught painter best known for her highly charged expressionist works, has embraced this shifting inversion in painting aesthetics liberated by a greatly expanded art world and market. The Nashville based artist and owner of L Gallery—where the artist commercially exhibits her work—has comprehensively hitched her artistic practice to the modernist giants of late as part of a continued investigation into hallmark abstract stylizations. Saffell’s most recent works discursively deploy signs and signifiers of process art, modified action painting, minimalism, color field painting, Italian Arte Povera, and Abstraction, all of which gesture towards artists like Wassily Kandinsky, Jackson Pollock, Sigmar Polke, Gerhard Richter, Cy Twombly, and Norman Lewis. This artistic simulacrum is readily apparent in two works from 2017. In these new works, Saffell employs the wide sweeping brush strokes of Expressionism but with the cautious constraint of reductive design. In Untitled (2017), grand loose mark makings bisect the picture plane in mustard, black, and peachy-taupe—an active horizontality which is minutely reaffirmed by the repetitive grid of squares which pattern the canvas’ surface. A solitary splatter of dripped red paint ornaments the center of the picture plane. Optical Illusion (2017) is a starkly minimal regression from all color and action. A near monochromatic save for a formal light blue rectangle, the work figures sparse black and white lines, ovular shapes, floating graphically in an expanse of middle grey. Stylistically disparate, the two paintings share the lexicon of recognizable abstraction. Invariably, Saffell’s use of paint denotes an aesthetic emphasis derivative of 1950’s Abstract Expressionism, an art movement which called for an interpretive model based on the analogy between a work and it’s maker. In this manner, the work’s surface is conceived of in terms of its “depth” much like the way an individual is understood to relate to his internal, or “truest”, self. Historically, abstraction has relied on this model to assume formal choices, medium specificity, and intent as an expression of the artists internal emotive landscape. Stylistically, Saffell interprets this artistic anointment through an efficient arrangement of modernist forms and techniques. As in Reality Check (2012), sweeping brush strokes in brash, bold, hues cauterize the picture plane amid drips and drops of slashed paint. Roughly applied swaths of acrid yellow, green, orange, and the purest blue float atop a lateral field of murky red, revealing the depth of the picture plane a pre-modern fallacy. Upon further consideration, various numerical groupings, letters, and fragmented words which have been scratched into the paint à la Basquiat become apparent. Untitled (2016) proceeds similarly in hue and composition, with Saffell confining her painterly brushstrokes behind rectangular color fields in black, yellow, red, and blue. The compositional resemblance to Piet Mondrian’s Ohne Titel (1921) is unmistakable. While abstraction fulfills a romantic celebration for the externalization of individual emotions, it is a genre and style wholly dependent on the notion that all persons share a common human experience which may be distilled in paint by a single gifted individual. As Carol Saffell continues to embrace the subjectivity and aesthetic language of new modernism, she is ever more conversant in producing art which is unequivocally familiar. Saffell’s paintings can be viewed at L Gallery at 11 Arcade Alley in downtown Nashville, at her website: carolsaffellart.com, and may soon be purchased in a variety of collectible textile forms. Carol Saffell, Untitled (2015), oil on canvas, 36x24in. Nick Cave: A Psychological Feat. An imposing human-like form stands erect on a white pedestal. It is clad in an impressive two piece ensemble whose surface has been consummately adorned with an array of silvered reflective buttons. The arms and feet of the garments inhabitant are shrouded in elongated fabric, it’s face a massive, flat, circular form whose dark fibrous facing swirls hypnotically. This extravagant material composition completely cloaks the armature, or figure, which occupies the form so bodily—rendering an encounter with this flamboyant exterior decidedly psychological. This ambiguous sculptural form, Soundsuit (2017) by artist Nick Cave, is one of several works included in Feat. at the Frist Center for the Visual Arts, a survey exhibition of phantasmagoric sculptural works and garments by Cave which quietly romanticize material identity. The Chicago-based artist is best known for his sensorial and absurdist wearable assemblages comprised of repurposed objects and craft materials—referred to by the artist as “soundsuits”—whose formal impetus is as a type of armour against racially motivated police brutality. Feat. is a continued curatorial approximation of Cave’s investigation into the preciousness of materiality and its latent function to simultaneously conceal and reveal. In this exhibition, Cave has eschewed former sensorial displays, electing instead for a quieter, and less polemic trajectory of works constructed over the last decade. Rescue (2014) figures a ceramic basset hound and vintage settee canopied beneath a net of metal flowers and ceramic birds, a material thematic repeated in the nesting synthetic headpiece of Soundsuit (2012). This motif is likewise apparent in the four massive wall panels which comprise Wall Relief, (2013), a chaotic sculptural detritus of strung crystals, afghan textiles, gramophone components, and disparate porcelain ware, all composed within a densely structural floral framework. A textural embodiment of Cave’s sculptural work, Wall Relief grapples with the material multiplicity of the sculptural Soundsuits but disavows the inherent tension of “concealing” in it’s immediate disillusioning relationship to the wall. Notably, more politically urgent works from recent years, such as TM 13, (2015)—a sculptural work which figures a black man in a hooded sweatshirt, who, ensconced in beaded netting, and which was constructed in direct reference to the fatal shooting of unarmed teenager Trayvon Martin in 2012—do not appear. Rather, Cave softly surfaces the visual language of identity politics in earlier works like, Untitled (2014), which figures a cast bronze arm extending out from a cacophonous pile of white linen folds, and a Soundsuit from 2012 which employs early African masquerade stylization in the form of sequins and crochet patterning. It is in these works which the black body figures most readily, albeit subtly, and that his implication of weighted material reference quite physically alludes to interior identities. It is the enigmatic selection of Soundsuits on exhibit in Feat. where Cave’s investigations of material identity is most psychologically tense. Exhibited along a long raised runway in one of the Frist’s more narrow rooms, ten of Cave’s monumental Soundsuits are staggered at various discursive angles. A seemingly hyperbolic assortment of festoons, buttons, beads, wires, ceramic vessels, knitted crochet, pipe cleaners, vintage toys, upholstery, amalgamated thrift items, and icons of collective nostalgia, have been interwoven to form idiosyncratic edifices for human containment. A Soundsuit from 2015 constructed from enameled can lids, shoelaces, plastic beads, and macramé, is one of the more abstract and resplendent suits on display, and which digresses quite entirely from the human form beneath. Certainly, despite the suits’ extravagant exterior materiality, the complexity of this work is manifest in the inherent function of a garment—to concurrently conceal and reveal the body. This ideology is iterated concisely in Blot (2012), perhaps one of the more surprising works in the exhibition. Breaking from the established quietude and object staticity upheld throughout Feat., this video work images a Soundsuit in action. In it, an amorphous figure enveloped in a multi-threaded suit of black raffia—a fiber extracted from palm trees native to tropical Africa and Madagascar—transposes upon itself in the stark whiteness of a single channel projection. The central figure contracts and extends volatilely from the center of the frame, intermittently revealing grasping hands and feet out from the folds of its shaking material vessel. It is not dissimilar in form from a Rorschach blot. Certainly, the repeated illusion to the necessary occupancy of these works by a body, and their relative lack of ascertainable identity, works well to construct a psychological mystique as to who and why a body might don these garments. Given the known origin of these works as armour for the black body against racially profiled police violence, there is plainly a social provocation. Yet, Feat. in it’s differentially quiet, still, curation, does not overtly call to racial injustice as it introduces an experiential element wrought with personal culpability. In entering the exhibition, visitors and patrons encounter a large wall affixed with a psychedelic wallpaper culled from a detailed photograph of Cave’s work. Upon it, the title “Feat.” refracts distorted faces of museum-goers in its mirrored surface. Referent to the abbreviation of “featuring” or a “feat of work”, this reflective introduction demonstrably implicates attendants in an actionable viewing experience whereby notice of the self is a cognizant and accountable instrument antecedent to accessing the work. Feat. is an interrogation of materiality, identity, and the causal relationship of those multitudinous solutions Cave has exhibited for his viewers. Nick Cave Soundsuit (2015). James Prinz photography. Angie Renfro debuts in Nashville with (de)construction (2017), an expressive series of floral paintings which employ surface condition as an equivalency for personal narrative. The newly Nashville-based artist is best known for her painterly depictions of desolate landscapes from her previous body of work Industry (2009-2016)—a practice thematically centered on what the artist terms a “longing for connection.” (de)construction is a continuation of Renfro’s investigations of self through the canvas originally manifest in those early works. In Industry, Renfro activates her layering of paint by emphasizing the painting’s various regressive and intermediary states of process. Previous marks, hues, and figurative shapes float softly behind the most recently applied veneers of oil. In The Lines We Draw (2014), acrid magenta and heavy umber brushstrokes form the hulking shape of a lone industrial mass. The figure is emergent from the bottom of the canvas and ensconced in an irreverently applied swath of dusty blue, an all-over application whose near opaque surface blushes prior hues. To Put Things Into Perspective (2014) features a receding line of power-lines made visually splintered by dripping lines of paint. Fragility (2017) from (de)construction proceeds similarly; muted orange, verdant blue, and deep yellow brush strokes coalesce at the center of the canvas to form the loosest expression of flora. Horizonless and floating untethered to any environment, the figure recalls the disparate nature and uncertain scale of those prior industrial forms. The manner in which Renfro approaches her figurative subjects, this reductive and additive process of painting, formally asserts depth up from the surface of the canvas. Renfro thoroughly works the illusion of verifiable depth in (de)construction and Industry by negotiating the romantic integrity of the picture plane. As in Everything Is As It Was, "Industry", (2009), painterly drips and sweeping brushstrokes are intermittently revealed beyond the surface’s topmost pale layers—a conscious mark making which signals the artist’s hand at work. This manner of seeing and interpreting was fundamental to early abstraction and later conceptual practices as it engaged the psychology of the artist as both quantitative substance and basis for theory. Seen most readily in the expressive, multi-layered, works in (de)construction, Renfro likewise posits the canvas as an emotive equivalency for her personal experience, enacting the process of painting to both consider and aestheticize personal narrative. Understood exclusively through the perceived interior mind of the artist, aesthetic choices, medium specificity, and function, are correlated in (de)construction and Industry to that of the artist’s psychology, albeit their subjective variation. Renfro personifies the paint and canvas through a layering process whose likeness is most readily akin to that of the artist’s internal self. The formal significance of Renfro’s work is grounded in the biographical matrix of it’s author; it’s condition of surface and depth most actively related to our consideration of the human mind. Angie Renfro, After All (2017), oil on panel, 30 x 18 inches. On March 17th, 2017 Dana Schutz’s painting Open Casket (2016) was unveiled at the Whitney Biennial and was, simultaneously, the impetus for heated international discourse concerning the validity of visual censorship and historic authorship over subjective content—it garnered protests and incited urgent reflection on the socio-political role of contemporary art, and artists, in the current political climate. Can a white artist make artwork about the black experience? How does a white artist pragmatically interpret the past, or narratives, not their own? This month, Tinney Contemporary premieres Joel Daniel Phillips: Welcome To The Orange West, a prescient exhibition of hyper realistic charcoal and graphite drawings which quietly sunder relics of collective nostalgia. Phillips, an artist best known for his evocative large format portraits of people at society’s fringe, found himself necessarily responsive to those queries warranted by Schutz’s painting earlier this year. Welcome To The Orange West is a continuation of Phillips investigations into the documentation of elusive narratives—yet marks a conscious re-examination of artistic culpability, historic ownership, and the hollowness of western romanticization. In these new works, Phillips forgoes portraiture entirely, pairing early reference materials from the early 1900’s with drawings of abandoned signage from along Route 66. Currently located in Tulsa as a Tulsa Artist Fellow, Phillips has been culling public archives and roadside relics from Oklahoma’s formational period as a method for parsing major events from the state’s history: the early oil boom, the purposeful extermination of American bison, and the land run. In Working Man’s Friend (2017), a crinkling arrow with limp fluorescent tubing denotes “used cars”, a phrase which partially obscures its earlier identity for “FREE PARKING” that has resurfaced after years of weathered erasure. Mounted below, a faded square sign near imperceptibly declares “the working man’s friend” on it’s torn surface. NY Hookah Lounge (2017) proceeds similarly; isolate amid white expanse, the roadside totem has been excavated and stripped by the sun. Only does the full-scale cast horse chained to its base posit temporal resistance: with its front hooves splayed majestically immobile, the plastic beast infinitely whinnies into the sky. Stylistically similar to Richard Avedon’s seminal portraits of western type casts In The American West (1979), Phillips has employed a starkly blank background and referentially high-noon lighting situation which effectively thrusts his subjects forward. Like “islands”, an advertising term for images that appear in the middle of page spreads, these meticulously rendered roadside monuments hover with near photographic realism at the center of the composition. As in Phillips Sirloin Steakhouse (2017), the use of a high contrast, seamless background works well to psychologically displace his subject from temporal constraints and inferred meaning by omitting its original context. Texture, detail, surface quality, and expression are illuminated. For Avedon, this sort of surface-centered depiction of people ultimately reduces the human form to a condition of surface; his is a glamorized conception of the American West whose subjects fulfill, or emulate, stereotypical roles of western settlement and fantasy. Phillips has negotiated a documentation of westernization whose evocation and subjective stance is emotively similar to Avedon’s but which he has parsed conscious of his personal nostalgia. Phillip’s use of the weathered road signs as visual equivalencies for polemical issues allows for an unburdened re-examination of these historical narratives. The topographic denigration of these weathered advertisements signals a looking back to original identities, layered histories, and the physical masking of a space’s original ownership. A particularly poignant documentation of the economic challenges faced by Tulsa, these monuments loom in Phillips work not as beaming tokens of small-town nostalgia, but as silent markers of what has come to be. The most surprising work in the exhibition is Then Your Plain Will Be Speckled With Cattle (2017). Breaking from the established nomenclature of physically encoded signage, Phillips has animated a series of drawings of the American bison in the semblance of an Eadweard Muybridge photographic sequence. In it, a single buffalo runs perpetually on loop, it’s bounding steps regaling it infinitely backwards through whiteness. FEATURE: Joel Daniel Phillips: Welcome to the Orange West. Originally published 10.1.2017, Nashville Arts Magazine. Seed Space gallery debuts Demetrius Oliver: Aeriform, an installation which poetically ruptures the dimensionality of sculpture through deft aesthetic gestures. The New York-based artist is best known for his use of prosaic materials in improvisatory and site-specific installations about atmospheric phenomenon—what he refers to as a process of “suggestion”. Aeriform is a continuation of Oliver’s metaphoric consideration of everyday materials to envision abstract experiences. In this site-specific installation, Oliver reinterprets material and sculptural elements occurring in his previous work within the constraints and limitations of the gallery space. The motif of a storm shutter reoccurs in this work as an obstructing barrier; Oliver has nailed a clear industrial storm shutter to the exterior of the doorframe, effectively barring entry into the exhibition space. It’s thickly corrugated surface disperses light from a single fixture above. Immediately on the other side of the ridged shutter an iridescent cast-resin air turbine sits just below eye level on a thin steel pedestal—it’s lowest shelf is occupied by a chrome turbine of the same size. In a poetic and frustrating conflation of screened visibility and limited physical access, Oliver, through disabling the only function of the doorway—a mechanism for transitioning into a new space—has transparently rendered the entrance symbolic and obsolete. Viewers spatially orient themselves several feet from the entry of the gallery, viewing Oliver’s sculptural intervention in context of its extended environment, an action which effectively shifts the physical domain of the gallery beyond the space it normally occupies. An astute example of Oliver’s penchant for materiality, the use of the storm shutter curiously situates Aeriform as both photographic and sculpturally resonant. Sealing the work along a two dimensional plane, the shutter visually flattens the physical space the work occupies, but in it’s tracslueceny, recalls the foreseeable depth of the room beyond. Likewise, the close proximity of the figurative sculpture to the other side of the shutter denotes a sense of unresolved confrontation—compelled to approach the sculptural piece which domineers the frame, we are unable to occupy the same space and our vision is impaired by a screen. Oliver’s poeticism in Aeriform arrives from a series of concise denials; the space is unenterable, the door frame is closed, the storm shutter mediates our pure vision of the sculptural work behind it, and the air turbines do not move. His allusion to the conduction and preservation of air through the turbines and the sealed storm shutter denotes an expectancy, or resolve, of possible functionality, yet it is still, and unburdened by real-life application. The final resonance of Aeriform is like much of Oliver’s work; singular, lyrical, and with imperceptible depth. Demetrius Oliver: Aeriform is on exhibit at Seed Space August 5th — September 23, 2017. At the back of the bar hangs an expansive gold framed mirror. 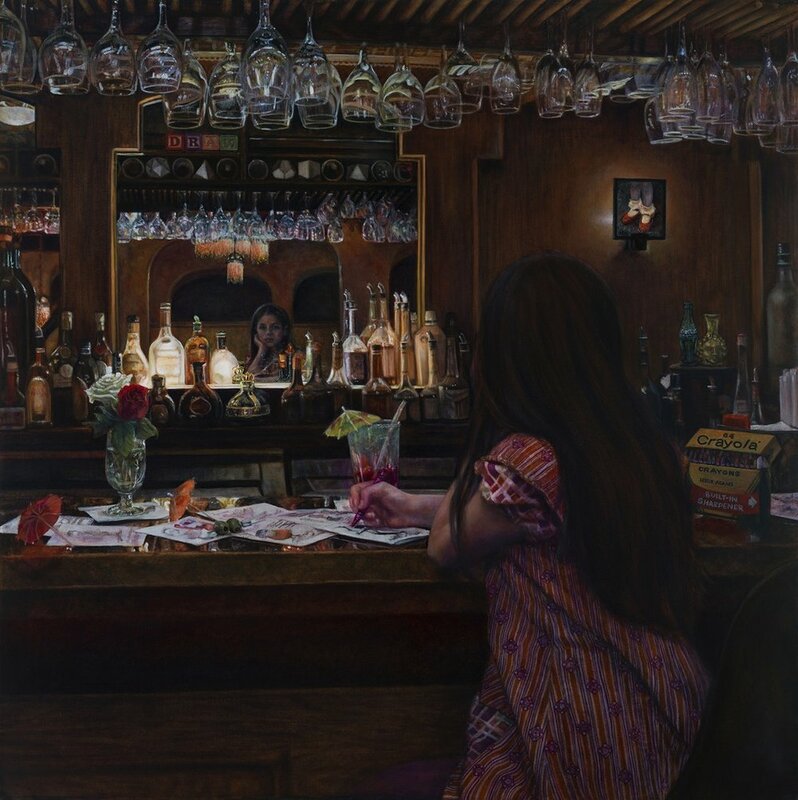 It’s surface illuminates an indelible assortment of colored glass bottles that have crowded at it’s edge; in its reflection, the gaze of a young woman seated alone at the bar is revealed. She sits with her back to us, hand poised mid-gesture above a drawing, her gaze considering at once both her own visage and her irrevocable encounter with us, the viewers. The painting, The Purity of Imagination and Color (2014) by Leslie Adams, is one of forty paintings featured in the premiere exhibition of Women Painting Women: In Earnest at the Customs House Museum in Clarksville, August 1 through October 1, 2017. Curated by Alia El-Bermani, in association with Diane Feissel, Co-Founders and Curators of Women Painting Women, and Terri Jordan, Curator of Exhibits at Customs House, the exhibition features the work of thirty current female artists whose provocations on the tradition of the medium are specific to the experiential and emotional veracity of contemporary women, as artists and immanent subjects. How does she envision herself? This is the latent inquiry posited by Adam’s reflective portrait of the young woman seated at the bar. Can a contemporary portrait of woman be exacted bereft of its original convention? It is a compelling question which has guided, and implicitly been answered, by over a dozen international exhibitions of Women Painting Women since it’s inception in 2009. Manifest as a matter of discourse between founders and painters Sadie Jernigan Valeri, Alia El-Bermani, and Diane Feissel following their encounter with a Sotheby’s auction and exhibition entitled “Women in Art”, but which did not include a single female artist, their conversation has continued to facilitate a contemporary imaging of women through art as social practice, curatorial-conceptual methodology, and a blog of the same name. “We are trying to promote the work of contemporary living female artists that primarily paint the female form and, specifically, not in a sexualized mode” said El-Bermani, “How do women see themselves, not just through the male gaze? It’s beyond just our sexuality and our sexual avilable-ness”. In the current socio-political climate wherein delineations on gender can be increasingly complex, and connoted with extremist typecasts of any overarching inclination, there is a certain stigma that can be associated when an exhibition specifies itself through gender. It is a systemic inclination to assume an exhibition of women artists is, or should be, overtly yonic or subjectively concerned with gender. However, El-Bermani is acutely aware of this—perhaps because it is a social condition not dissimilar from the historicized role of the woman as subject. She says, “...by saying “women painting women” we're not only saying that the subject is women, but that the painting itself is important, the work. It creates more of a thematic than a gendered exhibition”. Following nearly a decade of Women Painting Women, the premiere of In Earnest at the Customs House denotes a marked—and somewhat politically fortuitous—acceleration of it’s intent. Where previous exhibitions had been curated primarily by hosting galleries, and as such, ostensibly concerned with “sellable” artworks, In Earnest is the culmination of curatorial efforts by El-Bermani and Feissel which began nearly three years ago. A compelling and masterful exhibition of contemporary painting, this show is a fervent display of works whose content has been considered exclusively for its subjective intent, not its potential commercial viability. Demonstrably, a number of the works on exhibit are on loan from private collections, but a majority of the paintings are for sale. In this regard, In Earnest proffers viewers a unique opportunity to consider high-caliber works by a diverse group of contemporary female painters disparate from commercial oversight. Situationally politicized by current events and market-specific tendencies, Women Painting Women: In Earnest is an inspiriting and unadulterated exhibition of precisely what it has defined itself to represent; it is an evocative reconciling for the future of a medium unburdened by gender, market, or opportunity, and whose import is underscored by the prodigiously talented artists it represents. Following it’s premiere at Customs House (August 1 - October 1) Women Painting Women will travel to the J. Wayne Stark Galleries at Texas A&M, where it will on exhibit through the end of the year.